When looked at under the electron microscope, Gram-positive bacteria often contained localised in-foldings of the plasma membrane. These were given the name mesosomes, and were thought by some to act as attachment points for DNA during cell division, or to play a role in the formation of cross-walls. Others thought they were nothing more than artefacts produced by the rather elaborate sample preparation procedures necessary for electron microscopy. Nowadays, most microbiologists support the latter view. Members of the Archaea have a cell wall chemistry quite different to that described above (see Chapter 7). 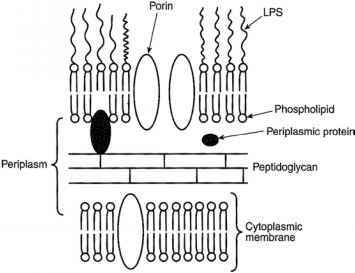 Instead of being based on peptidoglycan, they have other complex polysaccharides, although a distinction between gram-positive and gram-negative types still occurs.